She’s the worst person I’ve ever had the misfortune of knowing. I wish I was exaggerating. She abused me, neglected me, and ultimately abandoned me. For decades, I dreamt about her showing up in some form of shining armor to dispel the myth that she didn’t love me. And for decades, she haunted and disappointed me. What little girl easily accepts that her mother doesn’t love her? What little girl just moves on after discovering that she wasn’t wanted, and that she was thrown away? I ended up in an amazing family with loving, stable parents (who deserve – and will receive – more than the few words I’ve afforded them in this post), but nothing fills the hole left by a missing parent. All the night terrors in the world couldn’t shake my desire for her love. Her abuse and neglect didn’t end on my adoption day. Her manipulation of my good nature and underlying desire for her love continued until I shut the door for the umpteenth time almost four years ago, finally locking it. Last month, I received news that my biological mother is dying. Actually dying, this time. Her heart is giving up on her, sometimes beating only ten times in a minute. I don’t know how long a person can last when they’re dying this way, and this isn’t the first time she’s told us she’s on her way out or has something serious wrong with her. But for some reason, this time it feels real. I can’t really know because I’m nowhere near her and have no interest in reaching out to her to find out more – I’m basically limited to what my sister learns and shares with me. But it feels like it’s time. When my sister first told me about this, I felt relieved for a few minutes, but then felt anxious and restless. My bio mom and I have some serious unfinished business. This isn’t news to me, but my internal reaction to the reality of her eventual demise was much different from what I’ve felt in the past at the idea of her absence from this earth. I felt like I needed more, like I might lose important parts of my story and the chance for apologies I feel I deserve once she’s gone. I felt the weight of impending actual loss. Death is a final and complete rendering of the absolute loss of all memories experienced by an individual. Once someone is gone, so goes everything that lived inside them. There’s no way to recover any of it. There are no backups saved to a cloud somewhere. The idea that this person who brought me into this world and who is such a significant piece of my story will be gone soon holds for me a twinge of regret that I didn’t ask enough questions or learn enough about her or about that side of my family. I know of a few cousins that live nearby, but I couldn’t tell you my grandparents’ names or where they lived or who their kids were. The regret is as much for me as for my children. I don’t know half of my family medical history, and my kids won’t know a quarter of theirs. One of the coolest things about growing up with my [adoptive] mom is that her family has a deep understanding of their family tree – we had it in a computer program before most people even owned a computer! Missing out on this other side of my biological family tree, not knowing who my grandparents and ancestors are on that side, doesn’t really affect me that much, but I wish I had more to tell my kids. My desire to know my history has never and still doesn’t drive me to ask my bio mom anything. My need for my past does not overshadow my need for total separation from her or my need for mental health. I can’t imagine anything important enough to break that silence. But the loss of this information is nothing compared to the loss of the chance to receive the apology I’ve desired since I was young. As far as I know, she still hasn’t had the thought to apologize to me for anything. She thinks that how our stories unfolded together is acceptable, and that I don’t deserve any explanation or retribution. While I maintain responsibility for my actions, I also believe that she is the underlying reason for nearly every bad thing that has happened to me. The “root cause” of all the bad things. I have suffered from both short and long term memory loss my entire life because she missed Saying No To Drugs While Pregnant Day at her pre-natal class. I have juggled depression, anxiety, bipolar disorder, and borderline personality disorder as a result of early abuse, abandonment, neglect, and trauma caused by her complete lack of care for me. I got screwed out of going to college when she manipulated me into moving halfway across the country with her when I was a teenager. I lost my first child after she emotionally and physically abused me and abandoned me again in a strange place with no stable home, car, school, or job. Her lies got me off the track my life was on, the track I chose, and led me to everything else I’ve experienced, good and bad. I know it sounds like the blame game, and I sound like a petulant child to those who don’t know me well. I often think on this and wrestle with the idea that while my actions are my own, she is still the catalyst for all the bad things that I’ve endured. If she hadn’t [blank], [blank] wouldn’t have happened to me. All the things trace back to her. But I didn’t set out to write a scathing post about a woman who deserves nothing from me, even my hate – and I don’t hate her because I don’t believe in hating people. Void of hate, the scathing thing just sort of happens when I think about her. No, the real reason I’m writing about her is because of the loss I already feel at the reality of her being gone from this earth. Once she’s gone, there are no more chances. I’ve given her too many already, but despite my closing the door on her, I have hoped for two decades that she would somehow wake up and realize that I never deserved her disregard, her neglect, her manipulation. That someday she would reach out with real apologies and real love. That someday she would want to be a mother to me. For real. It’s never too late to fix your heart. It’s never too late to apologize, to try to make amends. If she contacted me today to tell me she hated herself for dumping me, I probably wouldn’t believe her, but I’d appreciate her effort. Instead, she’ll die and leave me with no closure. She’ll die and I’ll live on with the knowledge that the woman who carried and birthed me never cared about me. I’ll continue to carry that baggage. And I’ll use it the way I use all of the bad things in my life: to grow, to be a better person every day, and to be the best mother I can possibly be. So in the end, while I am not thankful for her or for what she’s put me through, and while I could have been an amazing person without her negative influence, I will find a way to turn her awfulness into good. Like I do. Have you had to close the door on a toxic person in your life? Share your story in the comments – it could help other readers figure out how to deal with the toxicity in their own lives! 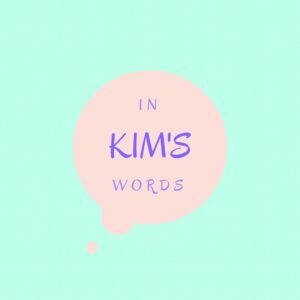 Subscribe to In Kim’s Words to have the latest thoughtful content delivered straight to your inbox. Click to follow In Kim's Words and receive notifications in your email when new posts are added.